I’ve been a personal trainer for six years and helped clients with all kinds of fitness goals. 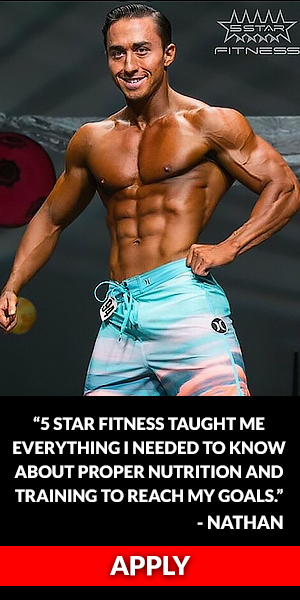 At some point, almost everyone on the 5 Star System asks about getting “six pack” abs. Since it’s such a popular topic, I wanted to write this blog post about it. Psst… read to the end for a video to help your ab training to the next level. A lot of people spend a ton of time doing crunches and never get a six pack. That’s because working out isn’t enough. To get a six pack you have to lower your body fat below 14%. That’s the point where your midsection starts to transform from flat to muscular. Rectus Abdominis originates at the bottom of the sternum and attaches at your pelvis. Your upper abs and lower abs are all part of the Rectus Abdominis, just different ends of the muscle. This helps you raise your knees to your chest. 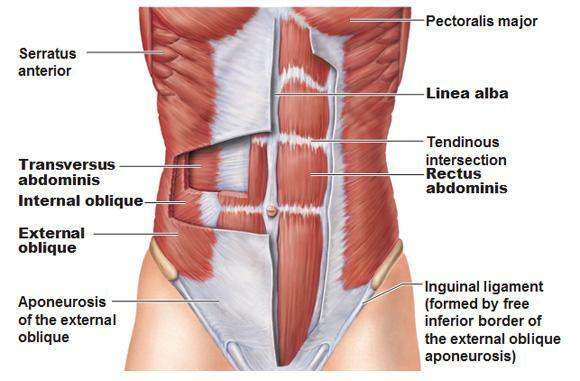 Transverse Abdominis is the deepest muscle of the core. It wraps around your entire midsection, keeping all of your internal organs in place. Strengthening your Transverse Abdominis will help shrink your waist and give you that tapered look. Obliques run diagonally down the sides of your body, between your rectus abdominis and lats. These help you twist your body from side to side. Tennis players and baseball players use these muscles a lot. Linea Alba is fibrous connective tissue that binds your Rectus Abdominis, Obliques, and Pecs. This fascia actually gives you the six pack appearance. Even if your genetics are great, achieving six pack abs still requires a commitment to regular diet and exercise. Remember, you have to get your body fat below 14% to have your abs show. Meal prepping is the best way to ensure you stick to your diet plan. Whenever you travel, always take high-protein snacks with you such as beef jerky, hard boiled eggs, or canned tuna. 1. Eat smaller meals to speed your metabolism. Skipping meals increases stress hormones and leads to unwanted fat storage. Eating several times a day will stabilize your blood sugar levels and prevent cravings. Try to eat something every 3-4 hours. Set an alarm on your phone to help you stay consistent. 2. Hit your macronutrient targets. All the food you eat falls into one of three macronutrient groups: proteins, carbohydrates, and fats. When you’re trying to drop bodyfat it’s best to get 40% of your overall calorie from proteins, 40% from carbohydrates, and 20% from fats. Use an app like LoseIt! or MyFitnessPal to count your macronutrients and you’ll start dialing in your diet in no time. When you’re even a little bit dehydrated your body will struggle to convert protein or carbs into energy. Carry a water bottle with you to the gym, the office, and even in your car. Thirst is actually the first sign of dehydration. Try to get drink at least a gallon a day. Your six pack simply won’t show unless your bodyfat is below 14%. Even good fats from avocados and nuts can keep you from getting the abs you’re working so hard for. Doing too much exercise can actually impede your progress. That means you can’t just “do more crunches” to get more results. When you plateau you have to somehow change the intensity, not the volume. I put together this video with slight modifications to popular exercises. Follow along and I guarantee you’ll see better results. The tips in this workout maximize the range of motion and touch on all the major components of your abs. Repeat each exercise four times. ¾ Crunch - You're actually resting at the very top of a full rep.
Russian Twist - Keep your knees and feet together to increase the intensity. Side Plank Hip Taps - Squeeze your obliques and change sides right away. Leg Lifts - Lift your feet parallel to the ground and pause for 1 second. Decline Medicine Ball Slams - Once you're into a rhythm pick up the tempo. Hit me up and let me know what you think about this workout. Exercising will improve your mood and make you more productive. If you don’t have time to get to the gym, then try this at-home workout. And don’t forget rest days. Consistently getting enough rest will prevent burnout. Make sure you allow yourself enough time to recover, especially after intense workouts. You actually get stronger in-between workouts. For bonus points, get a massage or take a yoga class. Are you ready to take it to the next level? Apply today.